A dental filling is required when a cavity or hole forms in a tooth. This is due to decay attacking the enamel and a filling is used to restore the tooth, preventing further damage. Decay eats away at the healthy enamel and causes cavities. If the cavity is left untreated it can grow in size and leave the inside of a tooth vulnerable to infection. 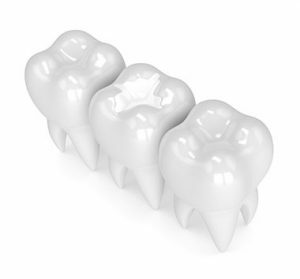 At Broseley Dental Practice we offer patients a range of filling types, from metallic to white. Metal fillings are made from gold or amalgam while white fillings are made from composite resin or porcelain. White fillings are barely visible once applied to the tooth, so many of our patients prefer these to traditional metal fillings. The affected tooth will be cleaned and the damaged enamel removed. The filling type you have selected will then be used to fill the cavity and prevent further damage to the natural tooth. Our dental team will advise you about cleaning techniques and how to avoid the need for further fillings.